Paris 36 is a colorful, splashy affair, a blend of drama and music that mixes the sweet with the bitter in a way only the French can. After watching Paris 36 , one thing becomes clear. Director Christophe Barratier is a rising star of French cinema, the creator of the kind of easily-digested French movies that are the hallmark of Jean-Pierre Jeunet ( Amelie ) and, albeit in a more gratuitous vein, perhaps the zestful sensibilities of Luc Besson ( The Fifth Element ). Barratier’s parents were thespians of the stage and he started studying music at the age of seven; both are lifestyle factors which have gone on to inform his current film work. Paris 36 is Barratier’s follow up to the marzipan-sweet The Chorus , another movie in which music figures heavily amid a sweet sense of humor and heart-tugging drama. This time, the setting is 1930s suburban Paris and the action centers around a theatre, the Chansonia, which is on the verge of financial ruin. The movie starts with a murder and then backtracks to show how events led up to that moment of darkness. The antagonist is a heartless landlord, a godfather figure named Galapiat (Bernard-Pierre Donnadieu, Le Retour de Martin Guerre ) who enjoys working in a dark study and wants to shut down the theatre and demolish the building. The protagonist is the long-suffering Germain Pigoil (Gerard Jugnot, The Chorus ), a loyal man of the theatre who has to endure not only Galapiat’s meddling, but also bear the disgrace of his wife cheating on him with two members of the troupe. Not only does he lose custody of his son, he loses his job, he loses his furniture, he loses just about everything. But is it all enough to drive Germain to murder? Or did somebody else do it? As events unfold, the Chansonia does shut down, leaving all those stagehands and talents unemployed. With few options on the table, they band together and take back the theatre by force (well, as “forcefully” as a theatre troupe can). They tear down the barricades and defy the landlord by cleaning up the place in hopes he’ll have a change of heart... maybe. Happy to work for free until the theatre earns its first receipts, the rag-tag band of performers and artistes flop with some heinously ill-conceived Vaudevillian acts. But then a star is born. Enter Douce (the undeniably incandescent Nora Arnezeder, Les Deux Mondes ). Initially hired as a jingle lady and eye candy to fill the gaps between acts, she brings down the house when she’s allowed to take center stage and do what she does best: Sing. With Paris 36 , Barratier has crafted the kind of movie that virtually demands to be seen more than once. The first time, take in the dialogue (or subtitles, your choice) and follow the story. Then go back to savor the lush theatricality that surrounds the action; this is a gorgeous production boasting some truly magnificent camerawork and fantastic musical numbers. And that music is the biggest joy of Paris 36 . The musical segments, presented in a play-within-the-movie storyline, are sublime. Songs like Enterree Sous le Bal and Partir Pour la Mer really do belong on the stage, lavished in spectacular production values. Given Broadway’s current bent toward pilfering from movies for new shows ( Young Frankenstein , Spamalot! , Legally Blonde and just about anything from the Disney canon are only a few recent examples), it’s really not that ludicrous a notion to think Paris 36 might one day make its stage debut. 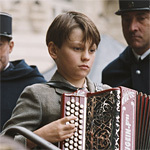 And, yeah, there’s also some accordion music that pushes Paris 36 to the realm of the quintessentially French. But that wonderful music is balanced with a large dose of melancholy. In addition to all the challenges facing Germain, there’s a strike in a laundry (a favorite French pastime, granted), the politics and prejudices of pre-war France and tales of romantic angst on several fronts.